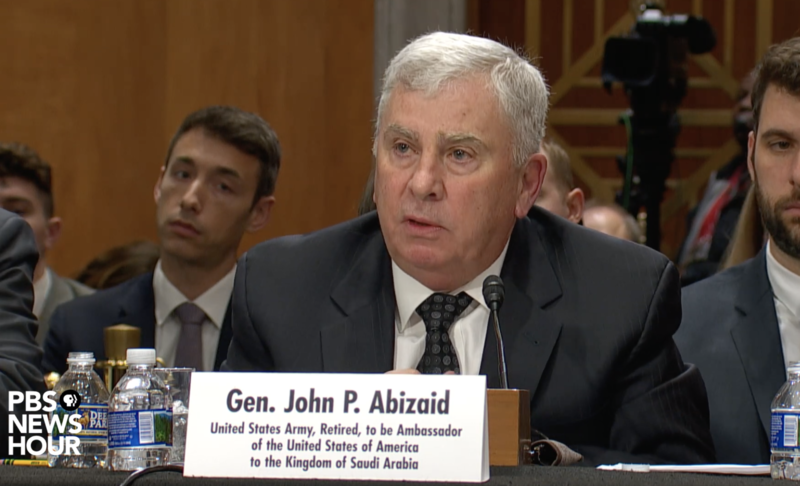 The Senate overwhelmingly voted to confirm retired Gen. John Abizaid as the new US Ambassador to Saudi Arabia on Wednesday in a 92-7 vote, paving the way for the former head of then U.S. Central Command to be the first person to fill the post since President Trump took office. Senators grilled Abizaid on the murder of Jamal Khashoggi, the war in Yemen, nuclear power, the rift between Saudi Arabia and Qatar, and recent decisions by Saudi leadership. Of the seven senators that voted against Abizaid, four have announced they are running for President. Sens. Gillibrand (D-NY), Harris (D-CA), Markey (D-MA), Merkley (D-OR), Udall (D-NM), Warren (D-MA), and Sanders (I-VT) voted against the nomination. A strong U.S.-Saudi relationship is in the best interests of the United States because “[d]oing so bolsters the self-defense capabilities of our partners and reduces the risk of harm to civilians,” Abizaid said during his confirmation hearing.